MUMBAI: In a bid to enhance the brand of the action adventure television show Lost US broadcaster ABC had launched an interactive web-based game Lost Experience in May in the US, UK and Australia. Currently in phase three of five of the interactive challenge, the meaning behind the numbers 4 8 15 16 23 42, which play a significant role on the television series, will be revealed. So far, the Lost Experience has unveiled information regarding the Black Rock. The Lost Experience will continue to the premiere of the third season revealing secrets behind the mysterious Alvar Hanso and the Hanso Foundation. Those wishing to participate can do so by viewing a synopsis at blogs.abc.com/inside_the_experience/ which allows new participants the chance to enter into the Experience with ease. For the uninitiated, the Lost Experience follows a parallel storyline not featured in the television broadcast and is designed so that both fans of the series and those unfamiliar with the show can participate. The Experience provides insight to unlock some of the island‘s secrets for those savvy enough to collect the clues, make the connections and find the answers. Although the Lost Experience is internet-based, participants should not assume that clues and story content will be limited to the online world. Any and every platform has the potential to contain hidden secrets. 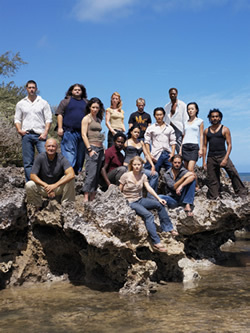 Given the different broadcast windows around the world, this challenge is designed in a manner that is not dependent on information specific to either Season One or Season Two, allowing those who have not yet seen either season of Lost to participate. The most mysterious, and perhaps most important of all the new characters is Desmond (Henry Ian Cusick), who begins the second season inside the hatch, explaining the importance of the button before taking off into the woods. The Lost Experience is a collaboration between the executive producers from Lost, ABC, Channel 4 in the UK and Channel 7 in Australia. Lost deals with the travails and experiences of a group of survivors from a plane crash. Talking about the online extension in the US, UK and Australia ABC senior VP marketing Mike Benson says, "The reward we‘ve always promised from the Lost Experience is information, which is currency to anyone who is a fan of the show or a participant in this game. "This additional form of storytelling allows us to engage current and new fans in a genuinely innovative way while delivering the same extraordinary content that ‘Lost‘ provides as a television series." In India, the second season of Lost will air on Star Movies from 3 August at 9 pm.